In our attempts to write about the characteristics of our racial gods and goddesses, it is all too easy to fall into the trap mentioned in other articles in this series – that of seeing them as literary figments, characters in old stories and not as beings actually existing in a wider reality than that of the material world. At the same time it is difficult to write about them without to some extent having recourse to the use of anthropomorphic symbolism. Our divinities are not distant from us in some “heaven”, cut off and aloof from the Earth. On the contrary, there is a continuous flow and ebb of communication between these divine forces and ourselves. This communication takes place, not usually as between one human being and another, face to face in the World of Form (although this too is possible) but during those times when we have expanded our consciousness, our awareness of reality, to take in the Worlds of Spirit that coexist with the material world – such times as when we are asleep and dream or when we induce the waking state called trance. Within these states of altered consciousness we exist in a wider reality – we have replaced the Universe with the Multiverse. Our communication with the beings who live in these wide realms takes place through our intuitive magical awareness, and our memories, when we return to our waking selves, can only be expressed symbolically if they are to be recorded and communicated to others. In writing about our gods, therefore, this fact of symbolic expression must always be kept before us. Our gods are beings of transcendent wonder, not the men and women writ large that descriptions of them would often lead us to believe. We must pause here to look at what we consider the misconceptions of our divinities that exist within Odinism itself. Too often we have been deluded into accepting the malign caricatures penned by Snorri Sturluson and his ilk. 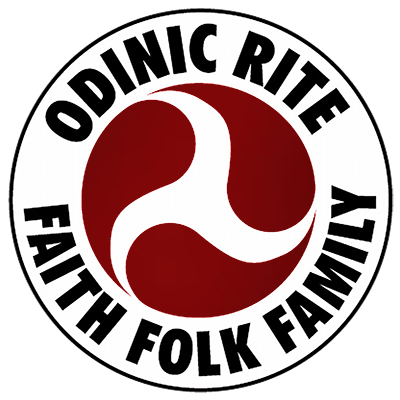 The author has heard a dedicated Odinist make the statement that Odin is a “trickster” and not to be trusted and has read in the works of another coreligionist that Odin – the Father of our People! – has “no grace in him”. They did a competent job of work, these old Christian disinformers! There is another concept within the broad Odinist movement that we find very strange: that which sees our gods not as divine spirits but as highly developed “humans” living on other planets who communicate with us by means of telepathy. This concept rejects the multiversal cosmos and is totally tied in to the material world. Another attitude that is to found in too many Odinists almost amounts to atheism. These persons also, mostly dedicated to the welfare of our people, are too closely tied in to the materialistic outlook of the age. They speak of the gods as abstractions, personifications of moral attitude, archetypes in the Jungian sense, seen as mere projections in their own minds. Through becoming adept at the practice of controlled dreaming and communicating with the spirits and divinites who exist in the worlds of Asgarth and Niflheim – the spirits who exist unseen behind the illusion of the World of Form – an awareness can be achieved of the primal truth that lies behind the verbal symbolism which we use to describe the divinities in subsequent articles in this series. We are not here concerned to show how the old vikings saw our gods but rather how they appear to us today. Before proceeding further, it is recommended that you read pages xxv-xxxii of Kevin Crossley-Holland’s Norse Myths. This section contains most of the distortions so assiduously propagated by Snorri and company. You will note that our conception of these divine beings differs greatly from that of Snorri and of Crossley-Holland. No writer who approaches this subject from the point of view of a Christian or who lacks the pagan attitudes to religion and magic can hope to produce anything other than distorted literary stereotypes, interesting perhaps for a student of history or comparative religion but meaningless for anyone who seeks to achieve real communication with real spiritual beings. Students of the Northern tradition of religion and magic are advised to put every effort into the development of their proficiency in the use of such meditative techniques that will enable them to find for themselves the way back to the old intuitive relationship our ancestors once had with the gods of our people.